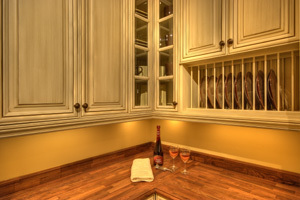 Another method of cabinetry construction is to use full access cabinetry. In this frameless method of construction, rails and stiles are not used. 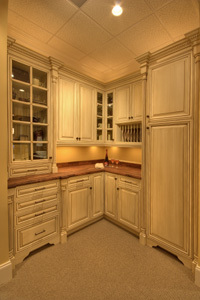 The doors and drawers will overlay the box frame entirely ensuring full access to the cabinetry. Cabinetry sides are 3/4” plywood. Front edges are edgebanded with wood tape to match the door wood species. Finished ends are used of 3/4” plywood. Raised panel ends are achieved by applying a raised panel to the side of the cabinet. Cabinetry tops and bottoms are 3/4” plywood. 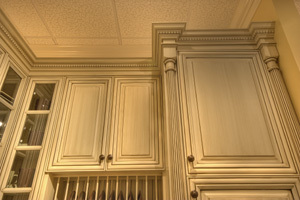 Tops and bottoms of wall cabinets and tops of tall cabinets are finished clear. Cabinet backs are 1/4” maple or birch plywood. Backs are inserted into a dado in the cabinet sides, top, and bottom. Shelves are 3/4” plywood with matching wood tape on the exposed edge. Open shelving will have a decorative nosing applied. All shelves are full depth and adjustable. Drawer boxes and roll out trays are 5/8” birch lumber with dovetail construction. Sides and ends are dadoes to receive a 1/4” plywood bottom. Drawers are installed on undermount, full extension, Blumotion guides. Roll out trays receive full extension guides. The standard hinge for frameless cabinetry is the Blum CLIP top hinge, with 6-way adjustability.